(Nanowerk News) Nanoscale drug delivery systems that distinguish tumors from healthy tissue are expected to revolutionize chemotherapy. By selectively releasing antitumor therapeutics into the appropriate target cells, these nanoparticles promise to limit the undesirable damaging side effects that are inherent to traditional anticancer agents. 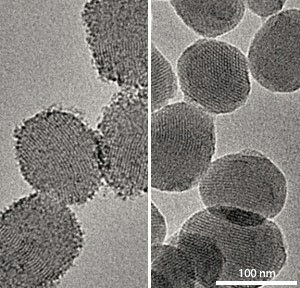 Guangshan Zhu and colleagues from Jilin University in China have now developed silica-based porous nanoparticles that liberate drug molecules in response to the low pH intracellular environment associated with cancers ("pH-Triggered Controlled Drug Release from Mesoporous Silica Nanoparticles via Intracelluar Dissolution of ZnO Nanolids"). Rapidly growing cancers are known to produce an acidic microenvironment in cells. This possible pH-based trigger has been explored by many materials scientists to engineer highly targeted nanosized drug carriers. However, previous systems rely on complicated syntheses and are not suitable for intracellular applications. Zhu's team devised a facile approach by capping drug-filled silica nanoparticles with acid-decomposable zinc oxide 'nanolids'. These easy-to-synthesize and inexpensive lids are stable under normal physiological conditions and dissolve rapidly in mildly acidic media. "The nanoparticles function as nanoscale Trojan horses, encapsulating the anticancer drug until reaching their intended site of action," says Zhu. The researchers prepared silica nanoparticles that bear two types of functional groups. Attached to the nanoparticle outer surface, carboxylic acid groups serve as anchors for the water-dispersible, luminescent caps. Positively charged amine groups located in the inner channels then hinder electrostatic interactions between the model drug doxorubin and the negatively charged nanoparticle pore walls. The team incubated the nanoparticles in a doxorubin solution before sealing the drug-loaded pores with the caps. Electron microscopy and spectroscopic analyses revealed that the 4 nm-wide lids were large enough to block the nanoparticle pores and prevent any drug leakage at pH 7.4. After incubation at pH 5.0, the capped nanoparticles showed smooth surfaces and lost their luminescence, confirming that the lids readily disintegrated (see image). This dissolution quickly freed the drug into the acidic solution. In vitro investigations demonstrated that the nanoparticles rapidly penetrated the cancer cells and delivered the drug directly into the acidic intracellular compartments upon lid decomposition. The researchers are currently developing other multifunctional 'smart' nanosystems for the targeted delivery of chemotherapeutic agents. "We are also planning to engineer anticancer cocktails to deliver multiple drugs simultaneously according to physiopathological signals," says Zhu.